At his long-anticipated new restaurant, the California legend will riff on taste memories and his grandmother's cooking as he continues to step away from avant-garde food. Chef Jeremy Fox is plating thick slices of beef tongue in the kitchen of his Atwater Village house. This is preparation for the future, R&D for a highly anticipated restaurant he hopes to open in L.A. this June, but it’s also a deep dive into the past. Fox, who was born in a suburb of Cleveland, would stay with his grandparents for about two months every summer in Yardley, Pennsylvania, where his grandmother would cook every single meal. There was a lot of family who lived nearby and regularly came over to eat. But Gladys would spend just as much effort cooking for three people as she would for fifteen. Fox was 8 or 9 when he first ate his grandmother’s beef tongue, and the experience was formative. Eating beef tongue and realizing it was delicious was Fox's gateway to a life of adventurous food. Now, tongue is a dish that represents the chef’s capacity for reinvention. Fox was chef de cuisine at fine-dining institution Manresa in Los Gatos, California. He was named a Food & Wine Best New Chef in 2008 for his work at Napa’s Ubuntu, where he revolutionized vegetable-forward cooking in a space attached to a yoga studio. Now he’s a star at Santa Monica’s Rustic Canyon, which showcases the produce at the Santa Monica Farmers Market but also gives carnivores plenty of options like Peads & Barnetts pork and a Flannery Beef T-bone. He also runs Tallula’s, a Mexican restaurant in Santa Monica that is very serious about the amount of cheese on its nachos. It’s clear that Fox, who wrote the On Vegetables cookbook and recently showed me the chicken cracklins and gribenes he’s putting into a side of kasha, has range. He didn’t start culinary school until he was 20. Gladys died not long after that, so Fox didn’t get to ask her enough questions about her recipes. When he’s developing Birdie G’s menu items, including the kasha and what he’s calling "Gladys' lengua pot roast," the process involves reverse-engineering food based on his memory. He remembers how Gladys made matzo-ball soup. He used to watch her roll the balls. But the matzo-ball soup Fox cooks for me at his house is also inspired by how his wife, Rachael Sheridan, makes matzo-ball soup. He uses her stock. The soup, packed with carrots, celery, and a generous amount of dill, is pure comfort. We sit down to eat it, as well as the tender tongue and the kasha with all of the beautiful chicken fat. Fox’s papillon, Butch, is enjoying being the center of attention while Birdie is at preschool. Butch devours some tongue. There’s a side of “country club greens,” inspired by a dish with roasted escarole, a long hot pepper, and shaved Parmesan cheese that Fox couldn’t stop eating at an Ohio country club near where Sheridan’s family lives. Fox’s version has chard, marinated pickled peppers (based on a recipe from Sheridan’s parents), and Parmesan. At some point he might try to make country club greens with kale, depending on what’s good at the market. He might use Pecorino cheese. 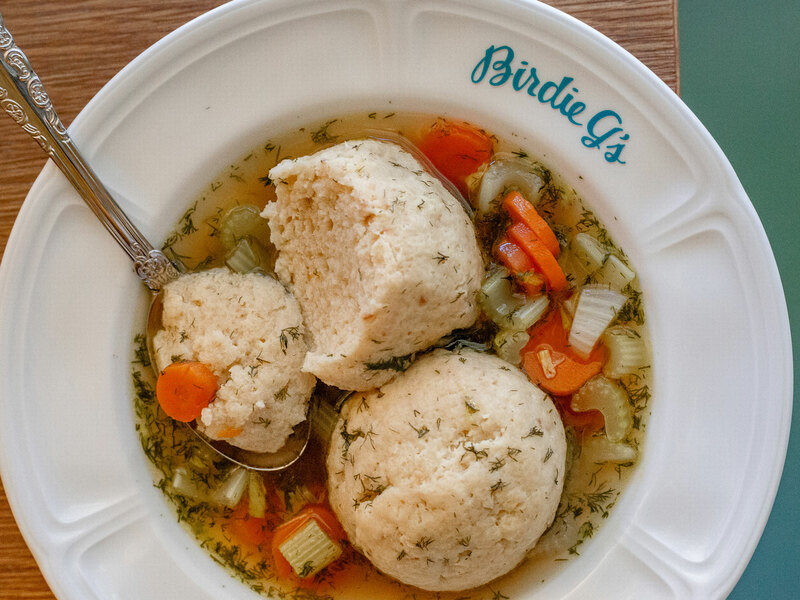 Like with so much of the menu he’s planning at Birdie G’s, Fox is riffing on a taste memory. He’s not looking to be avant-garde anymore. He doesn’t want to do “anything esoteric and cutting-edge and super-modern” in L.A. He’d much rather cook the kind of food he wants to eat all the time, so he hopes that Birdie G’s will be a restaurant guests return to again and again. Fox has had some trouble figuring out how to categorize Birdie G’s, but he knows for certain it will be “a little more whimsical and a little more decadent” than Rustic Canyon. “There’s no one descriptor other than 'I think it’s just an American restaurant,'” Fox says. “There’s not a restaurant that I’m basing it on, in terms of the food at least. But I’m basing it on, I guess, the feelings of places like Musso & Frank or Tadich up in San Francisco, places that have been around so long. And when they opened up, they weren’t old-school.” They were just elegant restaurants that scratched all kinds of itches. A section of the Birdie G's menu will offer wood-grilled California beef, “kind of steakhouse-style,” Fox says. Customers will be able to choose their own sauce when they order anything from a skirt steak to a filet to a rib eye for two. Fox isn’t planning to have a burger, but he’ll have what he’ll call a sloppy Jeremy. “It’s open-faced,” he says. “It’s Bolognese made with strawberry sofrito instead of tomato.” Fox will grind dry-aged beef scraps for the sandwich, which will be on Texas toast and served with horseradish cream. Beyond that, Birdie G’s will have four or five other open-faced sandwiches on Texas toast. Another sandwich that isn’t open-faced nods to a charred sweetbread dish that the Jocko’s steakhouse in Nipomo, California, cooks on an oak-powered outdoor fire. Fox discovered that restaurant when he was on a “meat road trip” with chef David Kinch and the crew at Manresa. This being a Jeremy Fox restaurant, Birdie G’s will have numerous vegetable options, including daikon piccata. 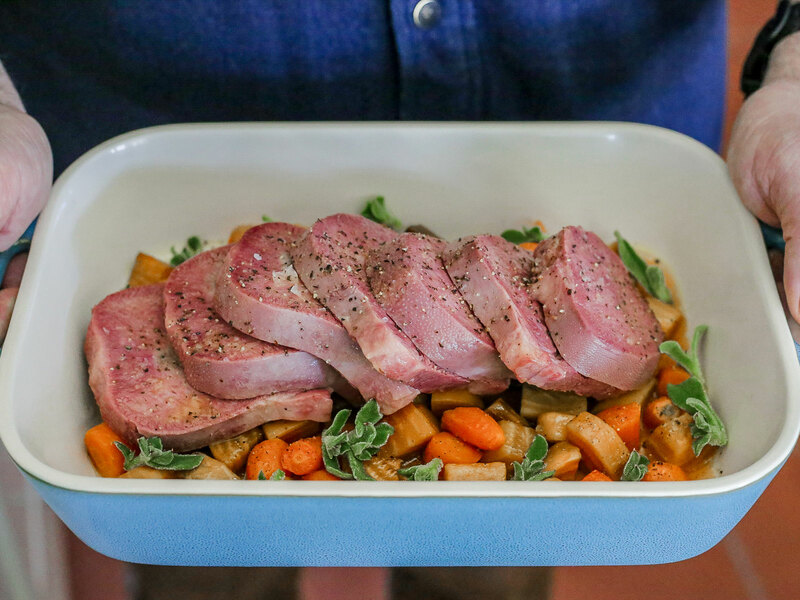 Fox will cook with ingredients like sunchokes, peas, or fava beans when they’re in season. A potato purée could work as a side for a steak or as a way to avoid meat altogether. “What’s important to me is that the restaurant should be what as many people as possible want to eat without feeling like you’re just playing to the crowds,” Fox says. 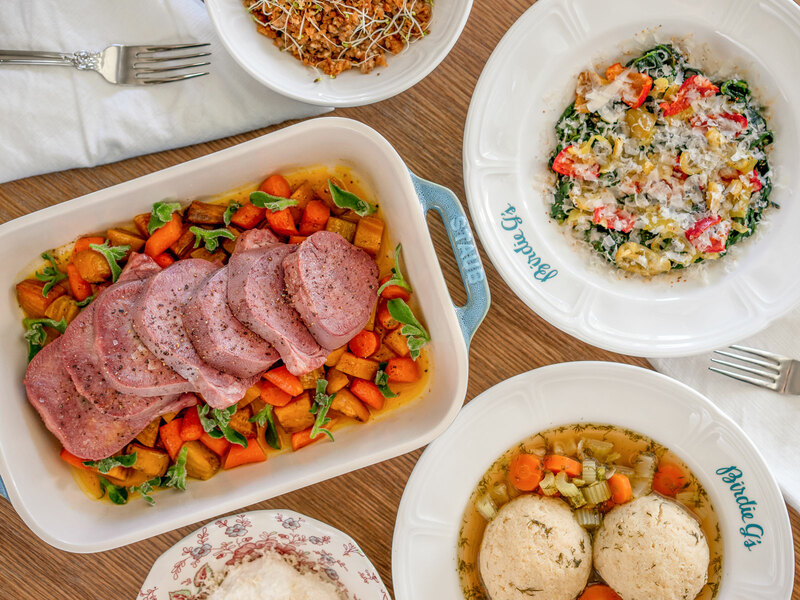 Maybe 10 to 15 percent of the menu will be a nod to Fox’s Jewish roots and the kind of food Gladys made. Much of what Birdie G’s will serve exists only in Fox’s head at the moment. He’s thinking of an “over-the-top” take on a Hangtown fry. 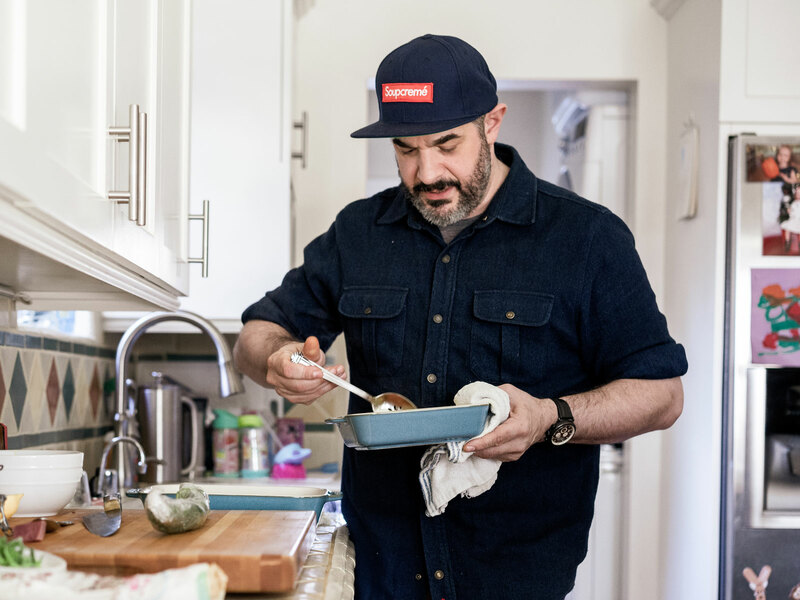 Fox’s version will be a Hangtown brei, something like three fried local oysters atop “kind of a set matzo brei.” He imagines that dish including a side of thick-cut pastrami or bacon and a little gravy boat of hollandaise. Fox wants to have daily blue-plate specials like the Wednesday lengua pot roast and a Sunday gumbo that Kinch taught him to make. Moules frites could be another special. Mongolian beef was something he loved eating in Atlanta, where he moved when he was 13. Fox might think a lot about the simple pleasures of childhood when he cooks in his dream kitchen at Birdie G’s. There will be a wood-burning grill, a griddle, a French top, and a prep kitchen in the back with CVap and convection ovens plus another stove. “There’ll be a 12-seat table that’s kind of right behind the pass where I expedite,” Fox says. “Eventually, I would like to offer a tasting menu at that table.” In the beginning, though, he will be busy showing his staff how to execute a lot of dishes that have been living in his head. On the day I visit his home, Fox receives a shipment of sample plates for Birdie G’s. While plating lunch, he talks about some of the ways he’s updated his grandmother’s food. He is, for example, using Badger Flame beets, which he says are like the Prada of beets. The seeds come from Dan Barber’s Row 7, and Aaron Choi of Girl and Dug Farms grows the super-sweet beets locally for Fox. Fox starts trying the spread of food on his table and smiles. “It definitely tastes like a memory,” he says. Birdie G’s, of course, will be a place where Fox’s daughter will form her own taste memories. Even though she’s just three, she already has a good understanding of what her father does. The proud parents remember looking at each other in disbelief. The ham rested. Then the family sat down and ate together.